It can go quickly when all parties involved are cooperative and the political will is there. 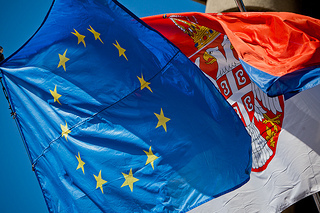 On Tuesday, the Council of the EU decided that accession talks with Serbia would start on 21 January 2014. This decision was based on a very positive report by EU High Representative Catherine Ashton. Back in March 2012, the EU granted Serbia candidate status. Since the historic agreement in April 2013 that allowed for a breakthrough between Belgrade and Pristina, most of the EU demands are fulfilled. Thus, Serbia has the green light to negotiate with the EU and become a full-fledged member of the union. Finally, Serbia will not be the pariah state of Europe but rather help to move Europe as a whole forward. A difficult and long process will start. As I have argued in summer 2012, it was actually a positive development that the so-called “EU-friendly” party of Boris Tadic lost the elections. Instead, hardliners like president Tomislav Nikolic came into power in Belgrade. As it turns out, these hardliners allowed for a political climate in Serbia where concessions to a more moderate view on Kosovo have been made possible. Although Nikolic was a staunch EU-critic, he quickly changed his perspectives and made clear that joining the EU is the only viable option for Serbia. At the beginning the biggest hurdle for Serbia’s accession was the cooperation with the International Criminal Tribunal on Former Yugoslavia (ICTY) in The Hague. Particularly the Netherlands blocked Serbia, impacted by the trauma of the inaction of Dutch blue helmets in Srebrenica in 1995. Now, however, Belgrade is much more willing to cooperate with The Hague. War Crimes Prosecutor Vladimir Vukcevic claims that one of the biggest successes would be that Serbian war criminals are not seen as representatives of Serbia but rather as what they have done the civil war: theft, torture, and devastation in the name of the Serbian state. Thus it should be in the interest of the Serbs that war criminals are not national heroes but rather suspects that either should prove their innocence or face justice for their wrongdoings. It was the historic agreement in April 2013 that the EU mediated between Serbia and Kosovo that was the first big breakthrough between Belgrade and Prishtina. Not least thanks to the diplomatic efforts of EU’s “foreign minister” Ashton, the break-away region in the south of Serbia had to come to terms with Belgrade. Just recently, Belgrade put quite some pressure on ethnic Serbs in northern Kosovo to allow for peaceful local elections. While the first attempt ended in chaos, the next two rounds were peaceful. Not least thanks to that development, as I pointed out here, the EU became convinced that Serbia should be rewarded for its efforts. Wisely, also Kosovo should be rewarded by finishing up its Stabilisation and Association Agreement (SAA) to get itself closer as well to get a candidate country. The problem remains though that five EU member states still do not recognize Kosovo because of their own issues with minority populations that demand a potential breakaway. Since 2010 Serbia officially asked to join the EU. While it was apparently Germany and the UK that were cautious about opening the accession talks, the pressure of the Lithuanian EU presidency helped to give Serbia the go-ahead. Also the optimistic tone of Ashton’s document on Serbia’s reforms will positively influence the decision of current member states. It is quite unrealistic though that Serbia will be able to join in four or five years as Prime Minister Ivica Dacic hopes. It took Croatia eight years before they were able to join, and their economic development is higher than the Serbian one. Tough economic reforms will be needed for Serbia to make the country fit and ready for the EU. There is a multitude of challenges ahead for Serbia: adhere to the rule of law, especially judicial reform, the fight against corruption and organized crime, public administration reform, the independence of key institutions, freedom of the media, countering discrimination and protection of minorities. The ban of the 2013 Gay Parade also reflects a homophobic attitude as such a parade was banned the third time in a row. Also the Kosovo issue will remain an issue despite the comparatively moderate voices voiced in Belgrade. However, an actual recognition of Kosovo and thus the unilateral declaration of independence from February 2008 still seems to be highly unlikely. Nonetheless, I believe that more and more Serbs realize that Kosovo is “lost” and looking to the level of corruption in Kosovo, some might even be happy that their own country is comparatively not in such a bad shape. The official negotiation for membership will hopefully be fair from the side of EU’s member states (not as it is in the case with Turkey) and Serbia be prepared for painful reforms while the government is under pressure to deliver results and improve the living standard. The structural reforms that have to be gone through during the negotiation period, however, most likely will only be seen after some years. This inherent challenge should be sweetened by the EU with enough financial support for the structural changes, whereby Serbia has to make sure not to embezzle the money. Instead of the pariah state that Serbia has been since almost two decades, it is about time that a much more positive image about this fascinating country will be dominating. Next Who will head the EU in 2015?